As expected, we were up at 5:00 this morning, and in the taxi to the airport by 6:00. There was quite a bit more traffic than expected – mostly trucks. We assume they were making deliveries to the port. An aspect of driving in Argentina that amazes us is that there are no lane markings. It’s a free for all – a bit like Italy, but even worse! Even our taxi driver said that Argentines (particularly those from Buenos Aires) are Italians in Spanish bodies!! We arrived at the airport, and had no clue what to do, so I stood in line at the Lan counter, while Mark went to search for any indication of Silversea. He found a couple of representatives, and they got us in the right queue. We got checked in, and headed to the gate. Funnily enough, the couple in front of us in line (Debbie and Tom) was from San Francisco, and he used to work as an actuary! He couldn’t get through the exams, and pursued a different career in the end, but how funny is that? Having had no breakfast, I stopped at the coffee shop for coffee and a baguette, which we shared. Without further ado, we were off at 9:20. The flight was 3 hours and 35 minutes, and we were served a snack on board. The seating was all economy, and Mark and I had a row to ourselves, so neither of us had to take the middle. I got to sit on the aisle, as I always have to get up so frequently to us the lavatory. The approach into Ushuaia was a little bumpy (windy), but the view was gorgeous. Tierra del Fuego, as the archipelago is called, is actually an island, which is separated from mainland South America by the Straits of Magellan. There are about a hundred islands, with the main island shared by Argentina and Chile, is home to Ushuaia. The city of 60,000 is set in a valley overlooked to the north by the Andes Mountains. The highest peak is named Olivia, and the peaks to her side are called the Five Brothers. We recovered our bags at baggage claim, and almost immediately handed them to a porter to be loaded on the boat. 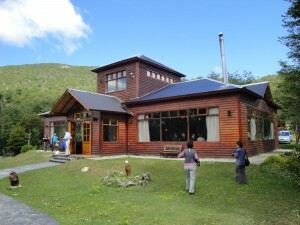 The next agenda item was lunch, at a small restaurant just outside of Ushuaia, Patagonia Mia. The main attraction was a huge platter of lamb barbeque on each table – served on braziers. Following lunch, we rolled back on to the coach, and went back to town to begin embarkation. Everybody was so excited – it was like being on a school field trip! Almost immediately, as we stepped through the door, we were given an arrival glass of champagne. We handed over our passports – as we are technically leaving and arriving back in Argentina, so we have our entry and exit must be processed by immigration. We received our personalized key cards, had a digital photo taken, and were escorted to our suite. (Day 5 – Part 2 is continued under Antarctic Cruise).